Greece's prime minister sketched out a path he hopes will finally allow his country to exit its seven-year-old economic crisis, holding out the possibility of positive growth this year and a partial return to the bond markets in 2017. Asked if he thought Greece could meet or exceed Eurostat's forecast of 2.7 percent growth for next year, Tsipras noted that it had exceeded the predictions so far this year and said that he expected "the same" for 2017. However, he said this would depend on the messages sent to the financial markets and whether there is a return of foreign investment. He also said he hoped Greece could within the next six months be included in the European Central Bank's quantitative easing (QE) program from which it has so far been excluded because of its low credit rating. If that happens, it could then test markets' appetite for Greek debt next year. "I think that will be a strong message we will be ready to prepare the procedure to issue bonds," he said. Tsipras said Greece's ability to issue some bonds next year, and to make a full return to the bond markets in 2018, depends on its getting debt relief, its growth improving, and its obtaining an ECB debt analysis showing whether its debt is sustainable and how the country can live within its means. He also said "one way or the other there should really be a breakthrough by the end of the year" on a debt relief proposal. Greece, which has received three international bailouts since 2010 and was nearly forced out of the euro zone last year, faces enormous hurdles to overcoming its financial crisis. Greece, the most heavily indebted country in the euro zone, has a debt to GDP ratio of more than 175 percent. Hardly the least of its obstacles is whether debt relief will materialize before Germany's 2017 election. German Chancellor Angela Merkel, under political pressure from Europe's refugee crisis and domestic hostility to repeated Greek bailouts, faces national elections in late 2017 but has yet to say whether she will run for a fourth term. Speaking in a hotel suite briefly rented for the interview - Tsipras noted his own room was far smaller, with no view - the prime minister appeared in a blue suit and his trademark open-necked shirt. Tsipras, who has said he would wear a tie if Greece received debt relief, smiled when asked about the promise and whether he was angry at Germany for not moving quicker on debt relief. "It is a very serious issue ... it is not simply about ties," he said. "It will change the ability of a country that has gone through quite a lot to actually have a sustained recovery." "Europe must push ahead, irrespective of the internal issues and the electoral processes in each country. We must look at common interests and not issues at a micro-political level," he said. Greece has been criticized by its lenders for failing to act aggressively enough on reforms that they believe are vital to getting its economic house in order. Under a deal signed last year with euro zone countries, the European Central Bank and the International Monetary Fund, Greece can receive assistance of up to 86 billion euros by 2018 in return for agreed reforms. A 10.3 billion euro tranche was approved in May, with 7.5 billion disbursed so far. The other 2.8 billion euros available through October depends on Greece fulfilling 15 reform targets. Second Review Completed in October? Tsipras said he expected to be able to complete the second review of the latest bailout program by the end of October and argued that the first review had covered the toughest issues. "From here on, each review will be crucial, but easier than the last one," he said. "We are rushing ... to be in a position to conclude the milestones at the end of September, start of October, at the scheduled Eurogroup, so at the end of October to be able to conclude the second review." The second review, which entails an unpopular loosening of labor laws, is conducted by officials from the "quartet" - the European Commission, the European Stability Mechanism, the European Central Bank and the International Monetary Fund. While the IMF is not officially part of the bailout, its presence in the review process is vital to reassure investors and creditors that Greece is abiding by the bailout program. Tsipras, whose labor minister has accused the IMF of taking an "extreme" stance on labor market reforms, said he thought it would be possible to work out a compromise but that the Fund needed to respect the "European acquis," a reference to the legislation and court decisions governing EU law. 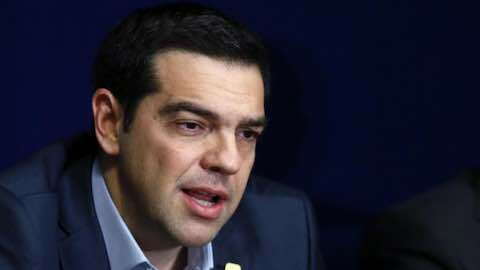 "I don't think we will have a difficulty in reaching a compromise on these issues," Tsipras said. Tsipras said Greece had hoped for a clear signal from its lenders in May that the crisis was over, but it had in effect been told that "we disagree on the debt measures, wait until the end of the year." "That is unfair for Greece," he said. "I am convinced our partners understand that and (by) the end of the year they will give a solution to allow us into QE and which will subsequently pave the way for a successful exit of Greece to the markets." Europe: "Tsipras Sketches Out Path for Greece"